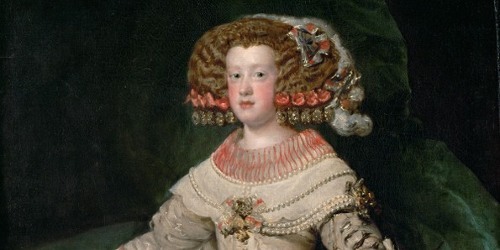 On June 7, 1660, as part of the plan to end the Franco-Prussian Spanish war, the Spanish royal family gave infanta Maria Theresa of Spain to France as Louis XIV’s bride. The hand-off happened on joint territory, the Isle of Pheasants in the Bidasao river between France and Spain. Nearly 350 years later, Arquiste’s founder and creative director Carlos Huber stood on the banks of the Bidasao and imagined the whole royal procession. In 2009, he began researching the meeting at the Isle of Pheasants and uncovered a wealth of aromas: iris from hair pomade; rice powder scented with orange flower; leather gloves; and, of course, the countryside’s arid herbal breeze. He wrote a brief based on his research and handed it to perfumers Rodrigo Flores-Roux and Yann Vasnier. Flores-Roux, born in Mexico, was tasked with creating a perfume inspired by the French side of the mission. The result was Fleur de Louis. Yann Vasnier, French, approached the event from the Spanish side and created Infanta en flor. Both fragrances were released in 2011. Arquiste Infanta en flor’s notes include cistus essence, bergamot, immortelle, orange flower absolute, jasmine concrete, Moroccan rose, Spanish leather accord, benzoin, cistus absolute, tonka bean and modern musks. The result is a tender, finely grained floral fragrance with the texture of chiffon cake and held gently but firmly together by herb-tinged soap. Straight from the sample tube, Infanta en flor smells like bright, rounded citrus with a jasmine and orange blossom kick. As it relaxes over the next five minutes, the orange blossom steps forward in all its soapy bridal glory, and a soft rose softens it with an olfactory touch of pink to its yellow-white. In the background — way back there — I can imagine the resinous shrubs that grow best with lots of heat and not much rain. After a few hours, Infanta en flor settles into a subtle soapiness that lasts a whole work day. Infanta en flor would make a terrific fragrance for a bride or a young woman (or, like Maria Theresa, a young woman of a bride) or for someone who wants a perfume that’s simply lovely, clean, and has nothing more to prove. 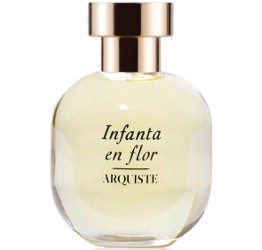 Arquiste Infanta en flor Eau de Parfum is $190 for 100 ml and $175 for 55 ml. For information on where to buy it, see Arquiste under Perfume Houses. Note: top image is The infanta Maria Theresa aged 14 [detail] by Diego Velázquez via Wikimedia Commons. “Fancy Shopping”! Yes! Barney’s was the only place that I saw had the 100 ml bottles, if it turns out that you love it. I probably shouldn’t comment at all since I woke up in a foul mood which has only deteriorated, and I really do appreciate your reviews, Angela, but are there no perfumers left who can compose a fragrance with a base other than modern/white musk? It’s as ubiquitous as everything else in pop culture. Sorry, I’ll step away from the keyboard and go clean my bathroom. Better yet, maybe you can clean my bathroom? Seriously, though, at least this musk doesn’t have that stinging, headache-inducing kick some of the new ones do. Now you have really piqued my interest. This sounds so lovely and easy. Another thing to add to the sampling list. I hope you’re sampling list isn’t as long as mine! *sigh* There’s so much out there to sniff. I think many in this line smell intriguing at first but get less and less interesting as time goes by. Of course, many perfumes these days have boring drydowns, but it’s more disappointing when they start out as well as these do. I really like Ella. Have you smelled that one? I know what you mean about perfumes that bamboozle you with a good lead, then draw to a ho-hum dry down, though! Franco-Prussian war = 1870-71. Sorry, bit of a history buff. Just ignore me. You are completely right, of course!! It should be the Franco-Spanish war! Thank you. And in my mind, the world needs more history buffs.